Love guacamole? Then you are going to love these Guacamole-Topped Cheese Crisps - they're bite-size appetizers loaded with flavour! Drop 1 tsp. cheese into each of 8 mounds, 3 inches apart, on rimmed baking sheet sprayed with cooking spray. Bake 3 to 5 min. or until golden brown. Cool 1 min. Remove from baking sheet with metal spatula; drain on paper towels. Meanwhile, repeat twice using remaining cheese. 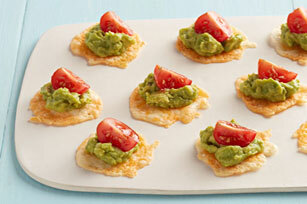 Place cheese crisps in single layer on serving plate; top with guacamole and tomatoes. Prepare using Cracker Barrel Shredded Habanero Heat Cheese. If you are serving a crowd, double or triple the ingredients and prepare as directed.